Tokyo Narita International Airport is one of two major airports serving the Japanese capital. An important transport hub for the whole of the country, the airport is responsible for the majority of international flights in and out of Japan. Our Tokyo Narita International Airport guide includes contact numbers, information on transportation and nearby accommodation, and details of terminal facilities. There are several information desks in all terminals. Tourist information counters are available on the ground floors of Terminal 1 (tel: +81 4 7630 3383) and Terminal 2 (tel: +81 4 7634 5877). From central Tokyo, head east/northeast on either the Higashi-Kanto Expressway or Keiyo Road, and merge onto the Shin-Kuko Expressway (toll road), which connects to the airport. The journey time is approximately 60 minutes, depending on traffic. A free shuttle bus links the terminals. Terminals 1 and 2 are roughly 10 minutes apart by road and Terminal 3 is located 500m (1,640ft) north of Terminal 2. Transfer between Terminal 2 and 3 is possible on foot. Bus: Keisei Bus (tel: +81 4 7712 7400; www.keiseibus.co.jp) runs services to a number of Tokyo destinations. The journey time into the city can be up to 90 minutes and fares start at around ¥3,000. To purchase a bus ticket, or find out more information about bus services, head to the Terminal 1 or 2 arrivals halls. Shuttle: Shuttle buses operate to Tokyo Haneda Airport, Tokyo Station, Shinjuku Station and major hotels in Tokyo, as well as many direct services to other cities such as Sendai, Utsunomiya and Omiya. Taxi: Taxis and limousines are readily available at the airport. This is an expensive option though (fare: around ¥22,000 for central Tokyo destinations) and the travel time can be much longer than by train. Rail:Passengers should check which terminal they require before setting off for the airport as the terminals have separate railway stations: Narita Airport Station (Terminal 1) and Airport Terminal 2 Station (Terminal 2 and 3). Keisei Electric Railways’ (tel: +81 3 3831 0131; www.keisei.co.jp) high-speed Narita Skyliner service is the fastest option between the airport and central Tokyo via a change onto Japan Railways’ (tel: +81 50 2016 1603; www.jreast.co.jp) Yamanote Line at Nippori. To purchase a rail ticket, or find out more information about rail services, head to the Terminal 1 or 2 arrivals halls. Banks, ATMs, and bureaux de change services are available throughout Terminals 1 and 2. There are a good variety of Japanese and Western restaurants at Tokyo Narita International Airport, as well as cafés, fast-food outlets and bars. There are options throughout the airport, but the majority can be found on the fourth floor of each terminal. Luggage storage services and luggage lockers are available in Terminals 1 and 2. For inquiries about lost items, contact the relevant airline or report to the airport’s Lost Property Office (tel: +81 4 7632 6049 [Terminal 1]; +81 4 7634 2157 [Terminals 2 and 3]). Other facilities at Tokyo Narita International Airport include medical clinics, a dentist, massage chairs, baby-change facilities, nurseries, children's play areas, showers and sleeping rooms. There is even a pet hotel in Terminal 2, which offers veterinary services. There is a business centre (tel: +81 4 7630 0035) on the fifth floor of Terminal 1, which provides fax and photocopying facilities, internet access and meeting rooms. Many of these services are also available at various points throughout the airport complex. Free Wi-Fi internet access is available throughout Terminals 1 and 2 at Tokyo Narita Airport - along with a faster paid-for connection. Courtesy mobile charging points are also available. Post boxes are located in front of passenger security screening, in the departure lobbies of Terminals 1 and 2. There is long and short-term parking at Tokyo Narita International Airport. 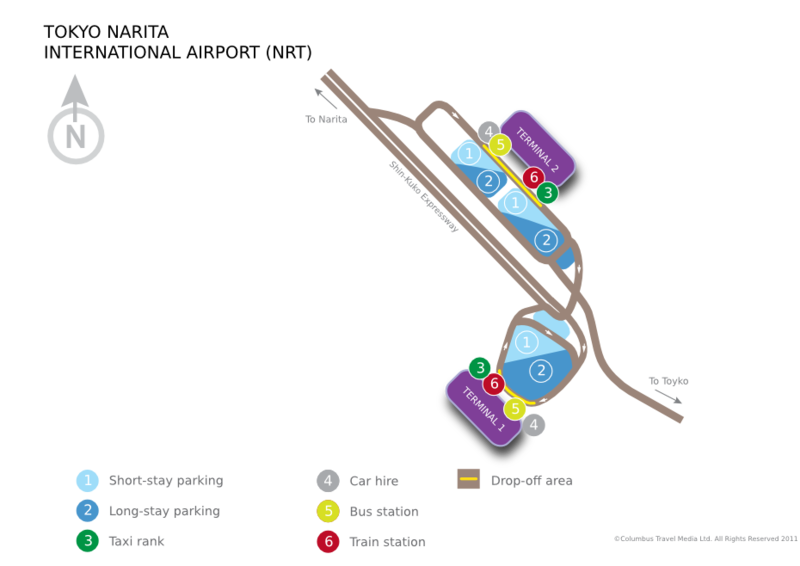 Car parks P1 and P5 are situated in front of Terminal 1, while car parks P2 and P3 are outside Terminal 2. The closest car park to Terminal 3 is P2. Car hire companies: Nippon, Nissan, ORIX, Times Car Rental and Toyota each have offices in the arrivals areas of Terminals 1 and 2.